I have a love/hate relationship with tomatoes. This year, I have 32 tomato plants in spite of knowing that tomatoes are notorious for being a lot of work in the garden. Still, in these early days of summer, everything is growing strong, looking great and setting fruit; so it’s easy to start feeling a little cocky. Yet, those of us with a few seasons under our belt know that this is the calm before the storm, and some of you may already be seeing signs of that inevitable trouble. No doubt about it, tomatoes are high maintenance. 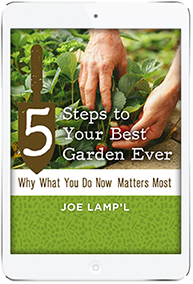 Fortunately, they are worth it, and there are some solid steps you can take for your best tomato plants ever. This week, Craig LeHoullier joins me for another tomato talk. When it comes to tomato experience and growing a lot of different varieties, Craig is king. 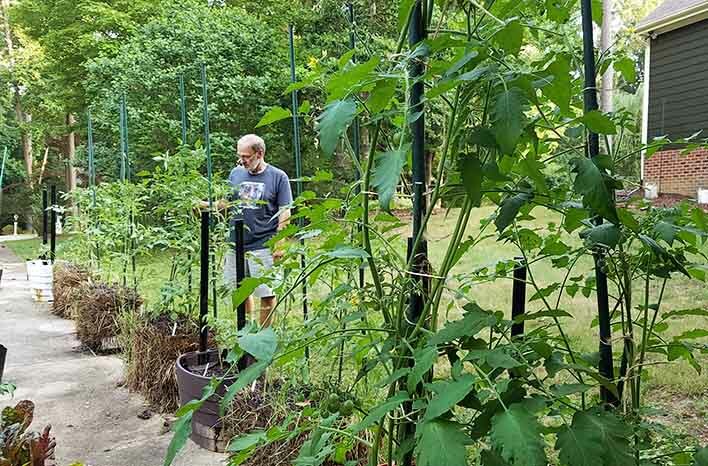 He has grown thousands of tomatoes each season in the small space of his home’s driveway. 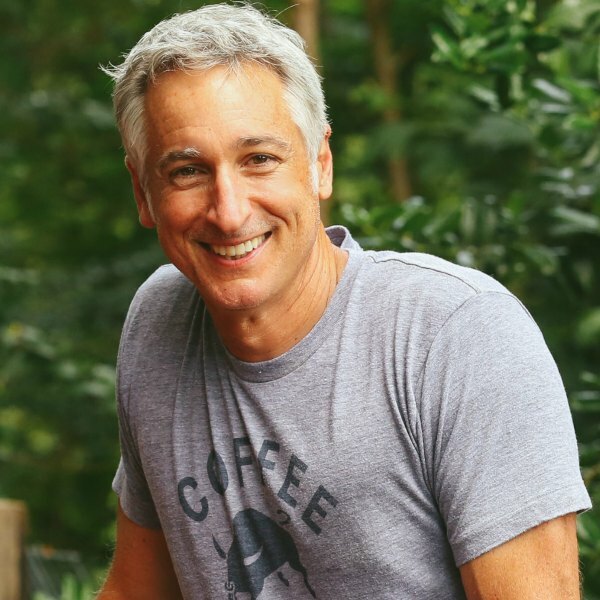 We featured Craig’s setup on an episode of Growing a Greener World, and Craig has been a frequent guest on this podcast series. So, let’s take a closer look at each step. When it comes to tomatoes, that last benefit is the most critical, since tomatoes are highly susceptible to soil-borne disease. Disease is often transmitted to tomato foliage by splashing up from the soil. When mulch is in place, the disease remains trapped underneath and is less likely to affect your plant. So, don’t forget this important step in your garden. 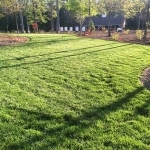 When you use an organic mulch material, such as leaves or arborist wood chips, that material will break down over time and feed your soil too – extra bonus points. Most varieties of tomato require some form of support. Indeterminate varieties are the prime example. Since they are actually vines, they will continue to grow and put on fruit until they are killed by a heavy frost. Determinate varieties will remain smaller – only about 3’ tall and 3’ wide, but they set all their fruit in a short period. That fruit weight can put a lot of stress on the plant’s branches. Even a dwarf variety – which has the fruiting properties of an indeterminate plant but with half the vertical growth rate – will require support just to help the plant bear the fruit weight without damage. 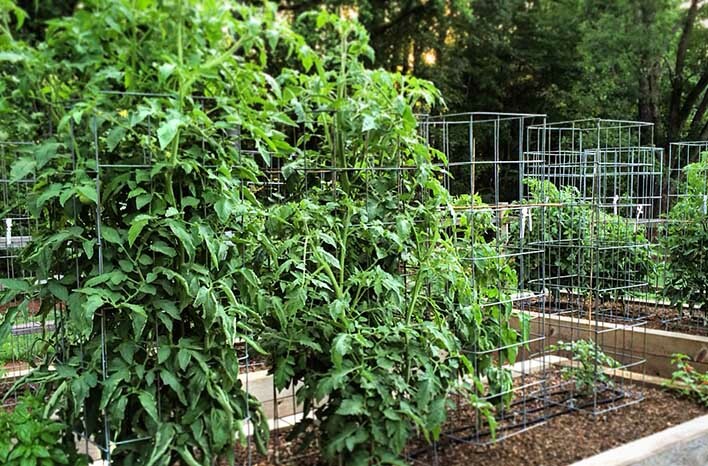 My ultimate tomato cages were the final answer to my tomato support problems. They are inexpensive, easy to make, durable, remain sturdy and stable as the plant matures, and they store beautifully during the off season. Just as importantly in the GardenFarm – they look sharp too. Supporting tomato plant growth also keeps foliage elevated and at lesser risk of disease. As with mulch, support will prevent soil contact and really cut down on issues. Craig knows some gardeners in the cooler northern U.S. hardiness zones who allow their indeterminate tomatoes to sprawl along the ground, like a squash or a melon. Cold winters of those northern climates kill many of the diseases which remain in warmer soils of the south. So, northern garden tomatoes are naturally at less risk of soil-borne disease. Support protects tomatoes from pests too. When foliage is elevated, it’s protected from slugs, rabbits and other garden invaders. Lastly, a supported tomato uses less garden real estate. Since the plant growth is kept in a contained vertical space, we as gardeners can make the most efficient use of the area available for growing other plants. So, what is the best method for support? Well, that depends somewhat on which type of plant you are growing. I struggled with tomato support for years. With a garden broadcast to millions through PBS each week, it was essential for the support I put in place to be sturdy enough to go the distance but also look attractive on camera. I knew the traditional, flimsy store-bought cones available for decades weren’t worth their weight in compost when it came to supporting the heirloom indeterminates I preferred to grow. Staking and trellising didn’t cut it for me either. Fortunately, I finally developed my ultimate tomato cage using livestock panels. My cages are strong, tall, attractive, easy to store in off-season, and they will last me for years. 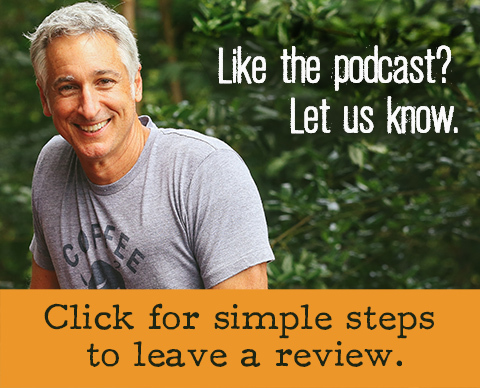 They’re an easy and inexpensive DIY project for any gardener, so I invite you to check out the How-to video. Now for dwarf or determinate variety tomatoes (like Roma or Taxi), the store-bought cones may work for you. Since these plants remain fairly small, they aren’t as likely to outgrow the overall cone size. That said, those plants will get heavy near the end of the season, and cones aren’t particularly strong. So, gardener beware. 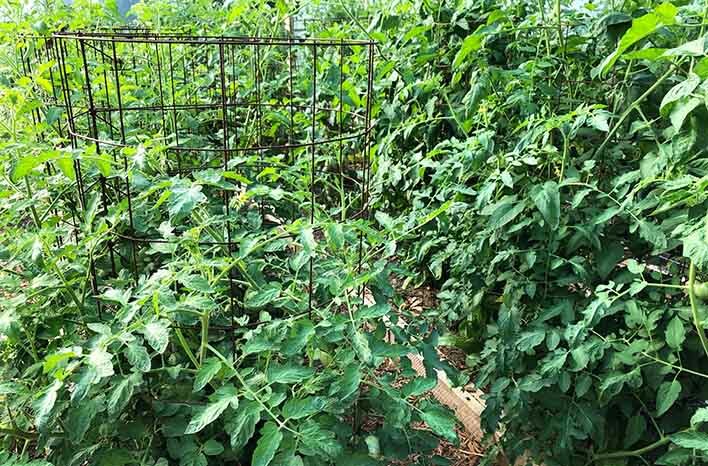 For any tomato variety, you might also consider using concrete reinforcing wire to build a support cage. This option is sturdy enough that it can support the heavy foliage and fruit but be sure to anchor a reinforcing wire cage to prevent it’s tipping over once the plant is fruiting and top-heavy. It would be a shame to step into the garden and discover your prized tomato has collapsed and suffered a premature demise. These cages, built of concrete reinforcing wire, can be a sturdy support solution. However, be sure to anchor them to prevent the structure from tipping over as the tomato becomes top-heavy with fruit. Craig likes to use stakes. 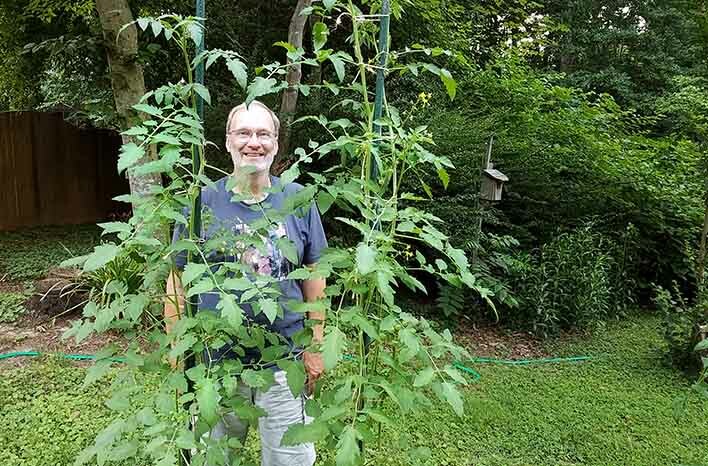 He drives one 8’ long, metal-core, plastic-coated stake (available at most box stores) into the ground about 6-8” from the base of the tomato plant. Every few days as the plant grows, he uses sisal twine to tie the plant stem to the stake at about 6” intervals. Throughout the season, he continues to corral the plant foliage around that single stake. 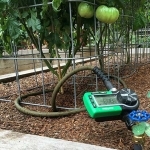 This system works for his large-fruit indeterminate varieties because Craig opts to remove most of the tomato plant suckers throughout the growing season. This brings us to the third item on his list. 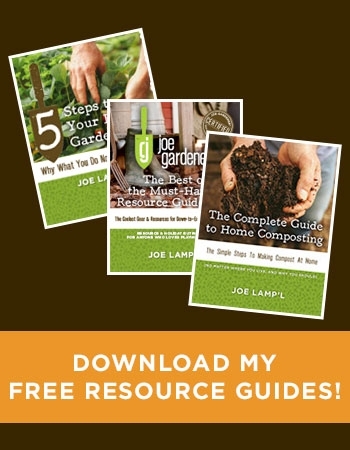 If you are new to gardening you may not realize that there are many different methods and schools of thought for growing a tomato. 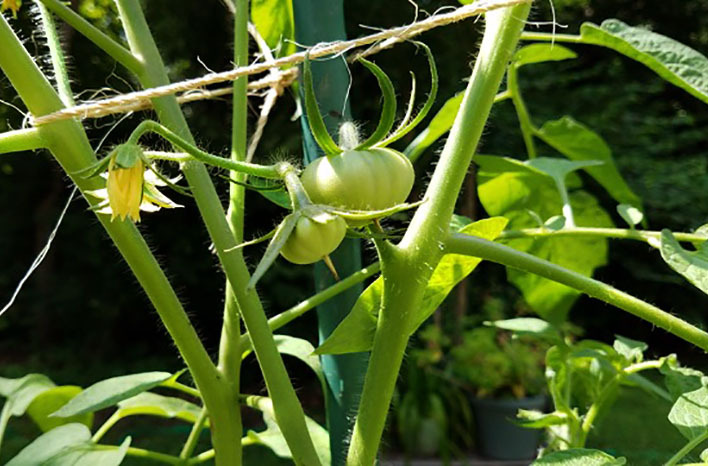 It’s commonly believed that removing the suckers from tomato plants throughout the season will allow the plant to focus its energy on fruit production, but that’s a garden myth. Removing suckers is primarily about managing growth. There are benefits and drawbacks to sucker removal. What is a sucker? Suckers grow from the area where each stem of leaves joins the main stem. The sucker develops into a new fruiting plant stem – from which more stems of leaves will grow and more suckers will develop. In other words – if left unchecked – a new fruiting stem will develop from the location of every stem of leaves. Since a sucker will become another stem, a single sucker will double a plant’s fruit production. As suckers continue to develop and are left on the plant, fruiting potential multiplies exponentially. So more stems can be a good thing. However this unchecked growth will also take up much more room and can inhibit light and air from reaching the inner area of the plant. Gardeners with space restrictions might opt to remove all the suckers and keep plant growth and fruit production to the main stem. This method allows plenty of air flow and light, but with less foliage to photosynthesize, the fruit may not be as flavorful. Fewer stems means less fruit production, and with less foliage to provide some protection, the fruit that does develop will be at greater risk of sunscald (a bleaching of spots on the skin). 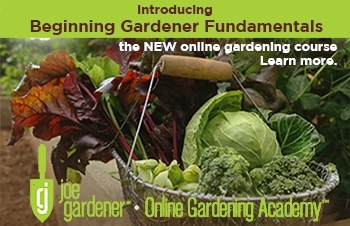 Most gardeners fall somewhere in the middle – developing their own balance between plant size and fruit production. Craig, for example, shapes his large indeterminate varieties to include just 4-5 stems, pruning off any other suckers which develop. On the other hand, he leaves all the suckers on cherry-type tomatoes. It’s all about personal preference and experimentation. How are suckers removed? While they are young – up to about 6” long – you can simply snap the suckers off where they meet the main stem. You can use suckers to produce new plants by placing the sucker in a glass of water to root, You can also place the sucker directly into soil and keep the area moist. After a couple of weeks, it will have rooted and will grow and fruit just like the parent plant. When you consider a juicy tomato is actually full of water, it stands to reason that the amount of water available during plant growth would be critical. Tomato plants are very water sensitive. They require consistent watering, so whenever possible, your best option is use soaker hose or to install a drip irrigation system. 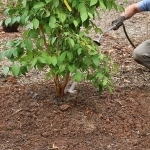 Soaker hoses are easy to find and are placed along the base of your plants. They slowly ooze water from their porous surface. Drip irrigation systems also provide a low, slow supply of water. The materials you need are readily available and can be inexpensive and easy to install – depending somewhat on the size of your garden. Both these methods will provide a consistent rate of moisture that will keep your tomatoes happy. 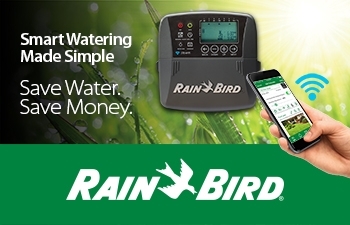 If drip irrigation isn’t an option for you, just take measures to water appropriately on a regular basis and to be mindful of when weather turns hotter and drier. Soil around your tomato plants should remain moist (not dry or soggy) like a sponge that has been wrung out. Early in your season, you may notice an abnormally large tomato blossom in what is sometimes called the Crown Cluster. The Crown Cluster is one of the earliest blossom clusters on the plant. More often than not, conditions aren’t ideal for pollination, so this striking blossom will simply fall off without producing fruit. How you water matters as much as how much you water. 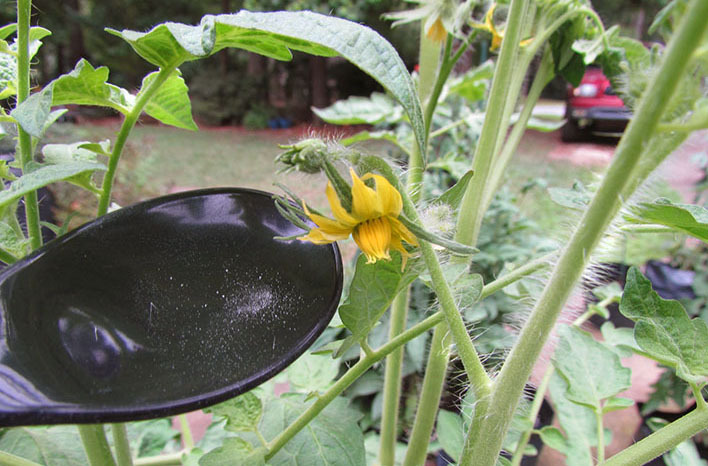 Keep water at the base of tomato plants and off of plant foliage. There are many diseases which are airborne and adhere to damp foliage. If you must water with an overhead sprinkler, be sure to do that during the dew period of early morning hours. That way, the foliage of your tomato plant will have more time to dry off throughout the day. In spite of your best intentions, all it can take for airborne disease to stick to foliage is simply high humidity, a rainstorm or the morning dew. So, it’s important to be proactive and check plants for first warning signs. But before we dive into monitoring, let’s talk about the next item on Craig’s list – feeding. What do you need to feed your tomatoes? Tomato plants are heavy feeders – meaning they extract from your soil through their roots a high quantity of nutrients. These plants are often growing faster than others in your garden, while also producing flowers, and then expending more energy to turn those flowers into fruit; so it’s easy to understand why they might need a bit more nutrition. All that work takes energy. So while I typically feed my soil to feed my plants, I do provide my tomatoes with a supplemental feeding of organic nutrients (like fish emulsion) a couple of times during the season. How often you should feed yours depends on where they are being grown. If water is draining from the soil around your tomato, there’s a good chance it’s also leaching out some of the nutrients available in that soil (especially water-soluble / liquid fertilizers). So, plants grown in containers will require more regular feedings – once a week is a good practice. 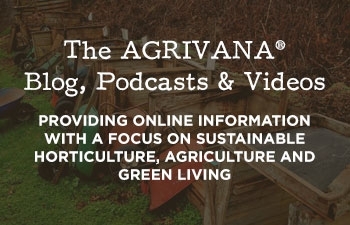 On the other hand, tomatoes grown in a raised bed or in the ground will only require two or three feedings during the season – since water isn’t leaching nutrients away (note that synthetic water-soluble / liquid fertilizers WILL leach from in-ground and raised bed soils – which is why I always recommend organic or organic-based fertilizers). What about the common practices of adding to the planting hole materials like epsom salts, eggshells or other items that are anecdotally believed to provide calcium that tomatoes need. Although these methods are commonly shared by gardeners as a means to prevent blossom end rot – the truth is, it’s just NOT true. This is a popular garden myth. Your tomatoes do need calcium, but that calcium is nearly always present in your soil naturally. If you have reason to suspect your soil is calcium deficient, I highly recommend you get an inexpensive and easy soil test, which will provide details on calcium levels, soil pH and lots of other key soil information. Blossom end rot – a darkening and rotting of the bottom of a tomato – IS caused by calcium deficiency but not in the way most people believe. The deficiency is actually the hindered movement of calcium through the plant to the fruit. What creates this movement? Water. 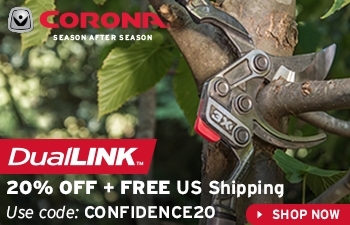 If you use soaker hose or drip irrigation, you probably won’t experience blossom end rot, because you are providing consistent moisture which allows the plant to efficiently process calcium and other nutrients. 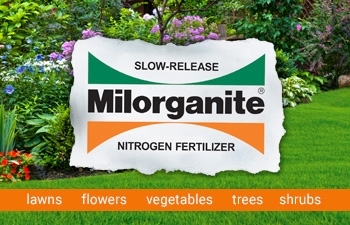 If your soil test indicates that your soil does require a calcium supplement, use a pelletized lime. Unlike egg shells, epsom salts, etc. ; pelletized lime will break down quickly to be available to your plants. Don’t use pelletized lime without understanding your soil pH, or you could shift your pH out of the range your plants require. Now if you do experience blossom end rot, simply adjust your watering. When you takes steps to deliver the right amount of water at a consistent rate, your tomato plant will adjust and, in a few weeks, your blossom end rot should disappear. 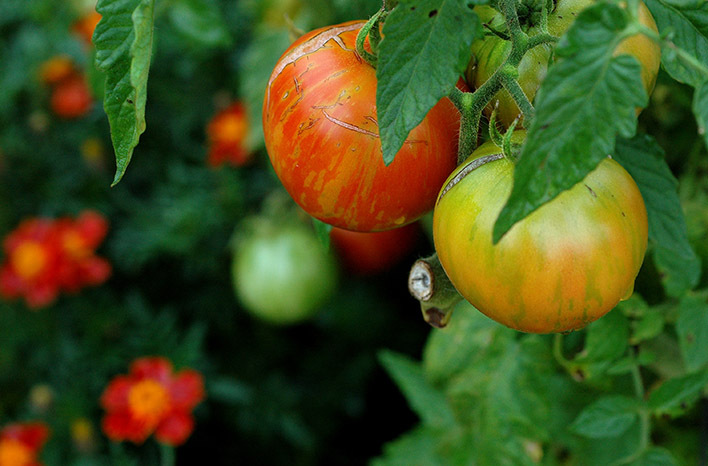 Tomatoes are more prone to disease than most other edibles in your garden. So, take time in your garden regularly to look over your plants and their fruit for early warning signs. Early proactive measures can make all the difference in your season. The lower leaves and the side of the plant opposite the sun are the most likely areas to show the first signs of a problem. Watch for yellowing, leaf curling, stippling, or other discoloration. The susceptibility of an heirloom tomato plant to diseases varies widely by variety. Brandywine, for example, is particularly vulnerable to Fusarium Wilt. While heirloom plants have varying degrees of natural resistance to disease, hybrid plants are bred to be tolerant or resistant to specific disease. When you buy a hybrid plant, you should see a letter or group of letters in the plant description to indicate which disease the hybrid variety has been bred against. For example, the Bush Early Girl Tomato will be marked with V,F,N,T – meaning it has been bred to be resistant to Verticillium (V) and Fusarium (F) wilts, Tobacco mosaic (T), and Nematodes (N). 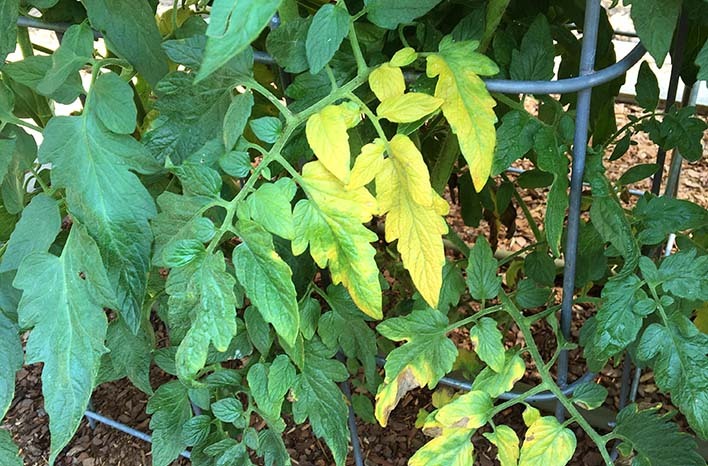 Yellowing leaves is a sure sign of Fusarium wilt – a fungus which exists in some soils. Unlike some fungi which attack foliage, Fusarium wilt attacks through the roots the system of the tomato plant, so it’s best to cut your losses and remove a Fusarium wilt-infected plant. However, there are no guarantees in gardening. Plant diseases are like the common cold – they evolve to stay ahead of plant breeders’ ability to find a cure for them. So, an indicator of “resistance” or “tolerance” is no guarantee that your plant won’t fall victim to that disease. What’s the difference between disease resistance and disease tolerance? Tolerance means that the disease can exist in or on the plant, but that plant will not be greatly impacted and will continue to grow and fruit. Resistance indicates the plant has some ability to fend off the disease from existing in or on it. So why does that matter? Well if your soil has a particularly strong presence of a disease like Fusarium wilt, even a plant with resistance to the disease can eventually succumb. A plant tolerant to Fusarium wilt won’t be impacted by a higher level – it will still be able to tolerate the presence of the fungus. Here’s where it gets really interesting: The level and presence of disease in your soil will be different than that of your neighbors – and it can also be different from one side of your garden to the other. You might have great luck growing a Sungold tomato in one spot of your garden – but continually struggle with disease if you plant the Sungold in another spot. So, experiment. There are hundreds of varieties of tomato – explore new ones each year to find the types which work best in your particular soil. If your Cherokee Purples are healthy in one location year after year, don’t feel the need to rotate them to a different spot. Alternatively if you keep losing plants in one location, try a different spot the following year – or switch to a container system. Always let observation in your garden be your guide. Sometimes you need to take action by simply pruning out a diseased stem or picking off pests by hand. Removing the problem area or visible pests may not stop the problem, but it will certainly slow the progression of it. 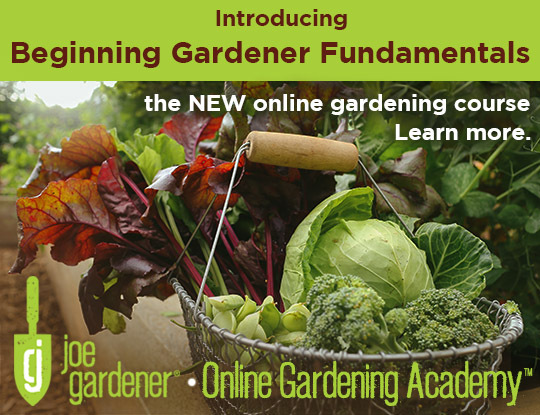 Your garden will never be a pristine environment, so expect some foliage damage. Just remain observant to prevent the situation from getting out of hand. There will be situations when it’s best to remove the plant altogether – just cut your losses. If your plant develops Fusarium wilt or a late blight, remove the plant before it spreads that disease to its plant neighbors. Never add diseased plant material to your compost pile – dispose of it and get it off of your property. Physical removal is always the safest option, but if you choose to spray a pesticide or herbicide, do so wisely. 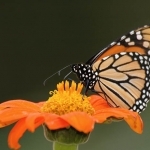 Take time to research the product and apply carefully to avoid unintended harm to other plants, beneficial insects or other friendly visitors to your garden. Action might also be needed to help fruit production along. It can be so frustrating when you observe lots of flower clusters on your plants, but the fruit just doesn’t seem to follow. 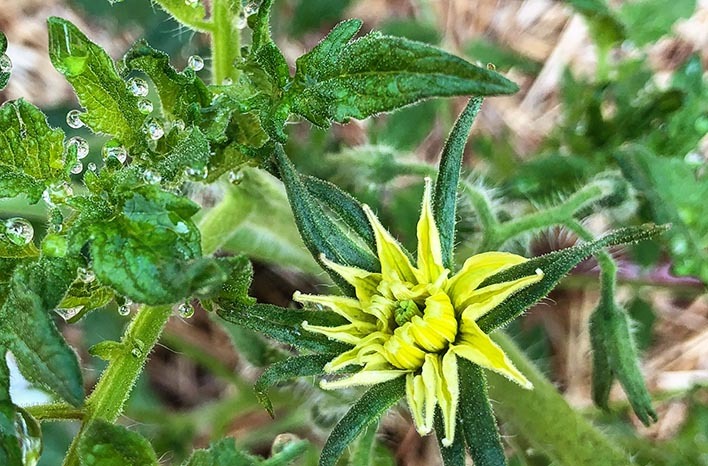 Tomato flowers can be surprisingly sensitive to less-than-ideal conditions for pollination. If the weather is particularly hot or humid, that condition may cause pollination to fail. You may just need to have patience. As the season goes on, new flowers which develop may be flowering at a time that better promotes fruit development. So, what to do if the problem persists? When Craig observes this phenomenon on his plants, he will gently tap the flower stem gently to help pollination along. That tap can help move pollen and improve the likelihood of fruiting. Whew! Who knew growing tomatoes could be so complex, right? But, actually, it’s this complexity that keeps us on our toes in the garden and which keep things interesting. So – keep experimenting. If something isn’t doing well for you in spite of your diligent efforts, don’t chalk it up to failure. Instead, document your experience and try another variety and/or method the following season. You will find what works best for you. Just keep trying. Although this is a fair bit of tomato care information, would you believe there is even more to learn in the recording itself? For example, Craig discusses how to make use of tomato fruit which has succumbed to Blossom End Rot. So if you haven’t listened already, scroll to the top of this page and look for the green bar under the title. You can listen by pressing the play icon. Also, my conversations with Craig are always just a lot of fun. 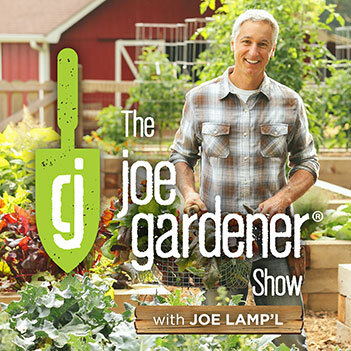 I hope you have fun – and grow as a gardener – while you listen in.